The Young and the Restless (Y&R) spoilers reveal that the CBS soap is offering a sizzling sneak peek for fans. A new preview video teases some of the hot action happening on Friday, March 23. Before we get to the clip, let’s set the stage. There are a few things you need to know about the upcoming fight between J.T. (Thad Luckinbell) and Victor (Eric Braeden). Y&R viewers can expect Victor to summon J.T. for a meeting. He’ll address the recent break-in, but that won’t even be the real reason Victor’s so upset. The Young and the Restless spoilers say Victor will have the spy cam footage from Victoria’s (Amelia Heinle) place. He’ll want J.T. to watch his horrific actions on the tape. J.T. will hit the roof when he learns Victor was spying on him. He’ll wonder how long he’s been watched. Victor will point out that J.T. did some spying of his own. He’ll rant about J.T.’s apparent plot to bring him down, but he’ll be more disgusted with the abuse Victoria received. Victoria accepts J.T.’s proposal earlier in the episode, so J.T. will reveal the big news. He’ll note that he has a future with Victoria and there’s nothing Victor can do to change that. Victor just won’t stand for this engagement. He’ll order J.T. to leave Genoa City immediately or be physically removed. If J.T. chooses to stay, Victor will promise that things are not going turn out well for him. After Victor yells that J.T.’s a loser, a brutal brawl will break out. That brings us to the sneak peek video. Y&R spoilers say their fight will leave them flailing all over the upstairs hallway. Victor will grab J.T. by the shoulders and push him into a nearby table. He’ll quickly pick J.T. up again and try to choke him. J.T. obviously won’t appreciate that, so he’ll gain the upper hand by jabbing his elbow into Victor’s side. When Victor throws a punch, J.T. will truly seethe. As he bares his gritted teeth, J.T. 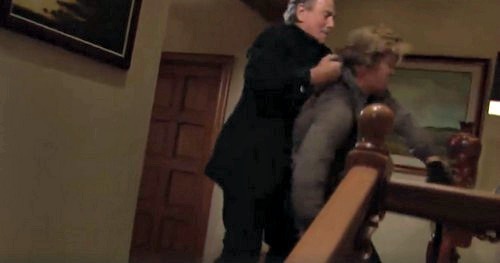 will lunge forward to shove Victor down the staircase. The move will definitely catch Victor off guard! The Young and the Restless spoilers state that we’ll see Victor fly in slow motion. Once he lands at the bottom of the stairs, he’ll be knocked out cold with life threatening injuries. J.T. will leave Victor for dead. Y&R fans won’t want to miss all Friday’s excitement! We’ll give you updates as other details emerge. Stick with the CBS soap and don’t forget to check CDL often for the latest Young and the Restless spoilers, updates and news.